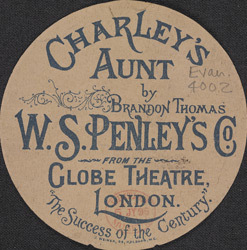 This leaflet advertises a production of Charley's Aunt at the Globe Theatre in London. The slapstick humour of Thomas Brandon's farce made it immediately popular on its original run at London's Theatre Royal in 1892. Two young men persuade a friend to dress up as their aunt to act as a chaperone when their girlfriends visit them, then their real aunt turns up unexpectedly. Thomas Brandon was an experienced actor and wrote this play for fellow actor WS Penley.